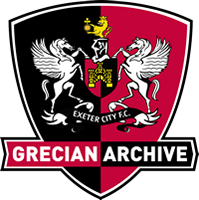 The silver foliage, that hangs on the wall of the boardroom at St James Park, is a gift from the Greek people of Andros because Exeter City fans are known as Grecians. The origin of this nickname has been debated many times over the years with suggestions ranging from links to political parties, inscriptions on an old clock in Sidwell St, and greasy children, referred to in historic Exeter texts as the gresy’uns! However, there are two key reasons why this name is associated with the football club. The first relates to the Greek Orthodox Church and the community which settled around it in the St James area in the 19th century. The second, and possibly most plausible, relates to the boundary set by the old city wall, as all those who lived outside the East Gate of the walls were known as 'Greeks' or 'Grecians'. In the 17th and 18th century it was common that classical plays such as the Iliad, where the Greeks lay siege to the city of Troy, were performed to the public on cathedral green. From this the term Grecian filtered into popular culture, and was adopted in order to give some of the city’s poorer residents a strong identity of their own. This border-related title of course included the people of St Sidwells and by association one of the founding sides of Exeter City, St Sidwells FC. Through making the site of St James Park the home of the club, the name was adopted by both the team and the fans and has remained to the present day.